Add 1 scoop Energy Greens to a smoothie for breakfast. Mix with 2 cups of water, 1 cup of frozen berries, 1 cup of fresh spinach, and a generous scoop of greens powder. Blend well and enjoy! Add 1 scoop of Energy Greens in a blender with about 5 strawberries, 1 cup of fat free yogurt, a small banana, 1 cup of orange juice and a scoop of whey protein or chia seeds. 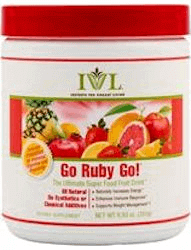 Add 1 scoop of Energy Greens with Go-Ruby-Go with your favorite diet fruit juice, low fat yogurt and frozen fruit like peaches, blueberries, and mango to the blender to make smoothies. Canned fruit - Yes, you can open up those cans like pineapple and mandarin oranges. Drain most of the liquid and freeze for your morning shake. Personal Favorite : Mixed with a half a cup of cold water with half of orange juice. Grind a coffee-scoop of chia seeds in a coffee grinder. Then mix in Energy Greens and shake it together with water (I like the blender bottle). If you allow the chia seeds to soak for a few minutes, the mix does soften. Add 1 scoop of Energy Greens to Sweet Tea (or a Tea and Lemonaid Combo). To lighten things up, try adding something with bubbles like Sprite, 7Up, or sparkling water. Add 1 scoop of Energy Greens to orange or cranberry juice and a quick stir. Done! Add 1 scoop of Energy Greens to your cold or hot green tea for an extra flavor boost. Looking for an extra punch? 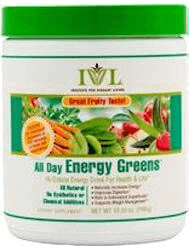 Try 1 scoop of Energy Greens mixed with V8 (low sodium). The tomato with Energy Greens flavor really complement each other. Add pepper, a few drops of Tabasco/Worcestershire and pinch of celery seed to spice things up! Think Bloody Mary, but you will feel better all day!